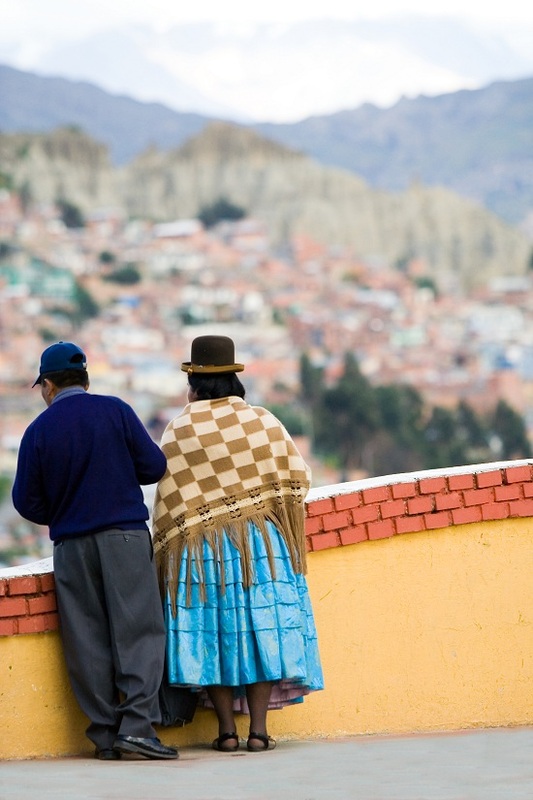 Suzanne Bearne gives the low-down on what you must see in South America’s cultural gem, Bolivia. Bolivia may be under-the-radar compared to its South American sister countries like Brazil and Columbia, but what this land-locked nation lacks in press exposure, it makes up in sparkling white colonial-style cities and a landscape that dazzles. Visit and you’ll be rewarded with rich culture, vibrant markets and jaw-dropping scenery – and coca leaves aplenty. The highlight of the south of Bolivia, and perhaps the entire country, is the Salar de Uyuni – otherwise known as the salt flats. Catching the mass of dazzling white salt flats against a backdrop of high mountain peaks for the first time is quite a surreal moment and so extraordinary that you’ll be running out of camera batteries in no time. And if that scenery is not enough to get you plotting a Bolivian adventure, the area is also home to the Eduardo Avaroa Andean Fauna National Reserve, a nature reserve with a red sparkling lake and wandering flocks of pink flamingos. All in all, it’s sight to behold. Bolivia’s “de facto” capital sits snugly within a deep canyon but still manages to pull off an altitude factor of more than 3,600m. It’s a city that’s bursting with paradoxes: office blocks sit tall in what appears to be a sprawling metropolis with cool restaurants and hip quarters, but there’s a backdrop of a valley slopes, mountains and ramshackle homes. Bolivians wearing traditional dress sit outside their stalls day after day, pumping out freshly squeezed orange juice or manning tables of textiles. The city has enough market stalls to suit every shopper. Get lost wandering down maze-like streets but as you do, make sure you find the Mercado de Heachiceria (Witches’ Market), where mummified llama foetuses, Andean textiles and herbs sit side by side. Oh, beautiful Sucre. With its colonial architecture and burnt orange rooftops, the city is a pretty place to recharge for a few days. While you’re here, head to the rooftop of San Felipe Neri, where you’ll be rewarded with spectacular views of Sucre. A good spot to spend an afternoon relaxing with a panoramic view of Sucre is Cafe Mirador, La Recoleta. If you want to spoil yourself, then order the chunky tiramisu. If, like me, you enjoy wandering amongst grand tombstones then just 20 minutes’ walk from the city centre lays Cementerio General. The cemetery holds mausoleums of former presidents and famous people, as well as regular folk. A good day trip from Sucre is Tarabuco, which takes one and a half hours to get to from Sucre, and hosts a colourful market every Sunday. 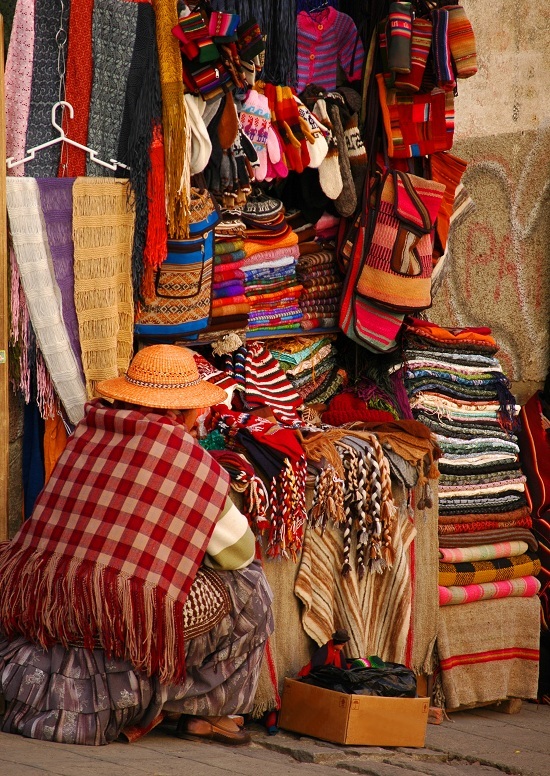 Textiles, such as blankets, wall decorations, hats and bags, are available to buy. Perfect for those scouting out unique gifts to bring home.